When it comes to helping global refugees — either in distant, war-torn countries or on the streets of your own town or city — there are several things you can do. Here are some practical, simple ways to help refugees make it across (often hostile) international borders, and have at least some hope of prospering once they've arrived at their ultimate destination. Hands down, the easiest, and most immediate, thing you can do to help global refugees is to donate your money — which can be used by the receiving charity to purchase food, medicine, materials, or any of the innumerable things displaced people need to reestablish some order in their daily lives. You just want to be careful to choose a reputable organization that channels the money directly to refugees and the other organizations that help them. The International Rescue Committee, Oxfam, and Doctors Without Borders are all trusted organizations that accept donations. As useful as it is, money can only go so far; sometimes, a specific skill set is called for to extricate a refugee from a precarious situation. Doctors and lawyers are always in demand, to provide medical care and navigate the intricacies of immigration law, but so are nurses and paralegals — and pretty much any kind of job can be useful in at least some way, if you're willing to think creatively. If you work in retail or food service, ask your management if they'd be willing to donate outdated food or inventory to the refugee community — and if you're employed in the tech sector, consider creating a web page or community board devoted to helping refugees. 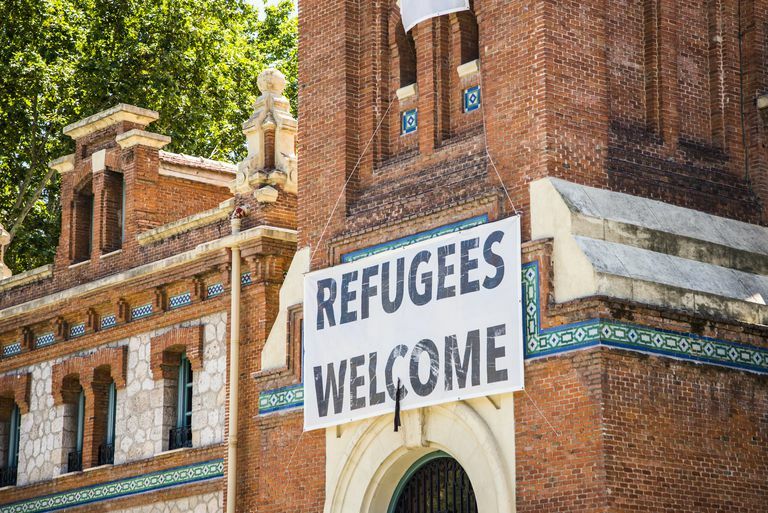 Charities and non-governmental organizations (NGOs) often have difficulty accommodating large groups of refugees, who need somewhere safe and stable to stay while their legal status is being sorted out. If you really want to help in a concrete way, consider putting up a refugee in a spare room in your home, or (if you happen to have a separate vacation home either in the U.S. or abroad) making that domicile available to a local charity or NGO. Some people have been using Airbnb to place refugees since the app makes it easy to juggle last-minute requests for shelter. Granted, your ability to employ a foreign national will hinge on local, state, and federal regulations — but even if it's impossible for you to hire a refugee full-time at your company, you can certainly pay him to do odd jobs, without having to worry about skirting the boundaries of the law. Not only will this provide the recipient with a source of income, for both him and his family, but it will also demonstrate to your less-sympathetic neighbors that there's absolutely nothing to be afraid of. If you know of a newly-settled refugee in your area who is trying to carve out a living — say, by running a dry cleaner or food stand — give that person your business, and try to convince your friends and neighbors to do the same. Doing so will help knit the refugee and his family into the economic fabric of your community, and it doesn't count as "charity," something that some refugees have mixed feelings about. In many cases, the quickest route to stability for younger refugees is to obtain a scholarship, which anchors them to a local college or university for a number of years — and makes it less likely that they'll be forcibly uprooted by immigration officials or victimized by sudden policy changes on the state or federal level. If you're active in your alumni community, consider working with the college administration, and your fellow grads, to set up a scholarship fund targeted specifically toward refugees in need. The Refugee Center keeps a list of scholarship funds that you can donate to. Many of the things we take for granted in the U.S. — hooking up our homes to the electric grid, getting a driver's license, enrolling our kids in school — are terra incognita for refugees. Helping refugees obtain these basic services will not only integrate them into your city or town, but it will also free up their valuable mental real estate to tackle deeper, more intractable issues, like getting a green card or applying for amnesty. For example, simply hooking up a refugee with a phone service provider, and making the down payment out of your own pocket, can be more direct and effective than simply donating a hundred bucks to charity.